Elaine Balden (Niverson) was a dancer on the Lawrence Welk Show from 1979 to 1982. She was Bobby Burgess's third partner, after Cissy King and Barbara Boylan. Balden grew up in Dallas, Texas with her parents Dorothy and Ben Colvin. After attending Sam Houston State University as a piano major, she switch her studies to dancing and attended the Arthur Murray Dance Studio. 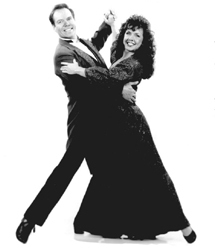 While touring with the Arthur Murray dancers, she was introduced to Bobby Burgess. After interviewing 20 other dancers, Burgess picked Balden and she was hired onto the Welk Show in 1979 on the "Salute to Love" episode. They often wore colorful costumes together on the show thanks to the wonderful wardrobe department led by Rose Weiss. Balden is married to Welk producer and cameraman, Jim Balden and they have two children together, Alana and Skyla. In addition to the Lawrence Welk Show, Jim Balden also has cameraman credits on the Barney Miller Show and the comedy show, Soap.